For decades, buy-sell agreements have paved the way for a natural life insurance sale. But there is no better time than now to bolster your clients’ buy-sell agreements using life insurance policies. Even if your business-owner clients already have some sort of buy-sell agreement in place, their life insurance policies may be out of alignment. Many businesses increased in value since 2009. The amount of life insurance death benefit originally purchased may no longer be sufficient to cover whatever value or formula is specified in the buy-sell agreement. And in many cases, business owners now plan to work longer than they had originally intended, because retirement accounts and real estate values took much of the last decade playing catch-up. Therefore, any term life insurance policies may be set to lapse before the insureds retire. There are three reasons to revisit the insurance strategy backing their buy-sell agreement: Today’s mortality pricing and underwriting standards are more forgiving than ever before; attractive permanent insurance options and conversion privileges come standard with many of today’s term life insurance products; and the addition of “living benefits” built into many of today’s life insurance products can provide payouts for chronic/critical illness and injury — helping to fill one of the biggest gaps in most buy-sell agreements. Of course, many business owners resist the notion of getting any life insurance, much less the legal drafting of a buy-sell agreement. But entrepreneurs should understand the only four possible outcomes from having no agreement in place or having insufficient funding to buy out a deceased partner’s heirs. 1. The business assets are liquidated in a fire sale, since a substantial chunk of its enterprise value went down with the owner who died. 2. Surviving owners plead with the bank to place debt on the wounded company, so they can buy out the deceased owner’s heirs. 3. The deceased owner’s heirs accept a long-term note for their ownership and hope the company can float years of payments despite losing a key person. 4. The deceased owner’s heirs refuse to release their inherited ownership, and the surviving owners must perpetually share the company’s distributions with them. The heirs may have a legal right to examine the company’s records and even vote with their ownership interest. Regardless, the surviving owners have a fiduciary duty to their new co-owners, even if they can’t ever contribute to the company’s growth. Couldn’t a plain old term policy avert all four of those horrible outcomes when combined with a properly drafted agreement? Yes, but today’s life insurance policies can take things a step further by helping to protect against disability as well as death. Those same four grim outcomes are in play if an owner becomes too sick or hurt to work. Isn’t disability much more likely to occur than death? Of course — that’s why disability insurance is significantly more expensive than life insurance, and why many business owners will often opt to roll the dice rather than insure for the risk. What if their life insurance policy also had living benefit provisions in case they were too sick or hurt to work again? Will these living benefit provisions be as comprehensive as a true own-occupation disability policy? No. In fact, they may just advance a portion of the death benefit and only for the most severe health conditions. To be clear, I’m not saying that you should only recommend one of these hybrid life insurance policies over a true disability policy. Since a true disability buy-out policy will often have the most comprehensive definition of disability, you should always offer it as an option even if it costs more money than your client plans to spend. Then you’ve fulfilled your duty as an advisor offering them education on their options. If they decline a true disability policy, then at least a hybrid life insurance policy with living benefits is better than nothing to hedge against this serious risk. Wouldn’t a disabled owner feel much better about accepting a note for his company equity if it came with a hefty down payment? Don’t most of your business-owner clients have that “I’ll die with my boots on” mentality? If these living benefits came bolted onto a life insurance policy for a fraction of the cost, you will have done them, their partners and their family a great service by helping to shore up this gap in their buy-sell agreements. 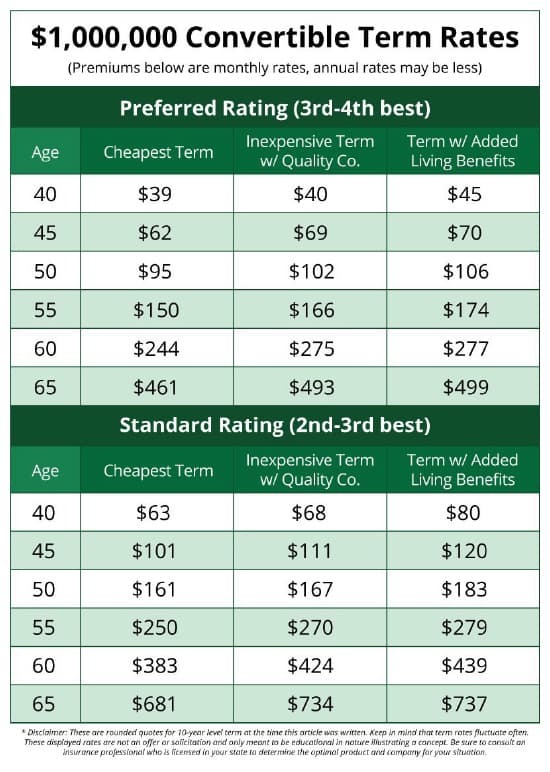 Some term life insurance policies even include these living benefits for a nominal increase in premium over the cheapest term policies. And these same term policies can be converted (without evidence of insurability) to a comparable permanent policy with the same life insurance company anytime throughout the policy’s term. The grid with this article compares the cheapest term insurance next to fairly inexpensive term insurance with solid conversion options, and the last column shows convertible term insurance with built-in living benefit protection. Most clients are happy to pay a little extra premium for a lot of extra protection. I’m not saying that term insurance is necessarily the best solution. However, we know that our business-owner clients usually think of insurance as a pure cost eroding their bottom line. That is, until we can educate them properly about the unique wealth-building characteristics of permanent insurance. Here are a few reasons to fund a buy-sell agreement using permanent life insurance. First of all, permanent policies often have more robust living benefit provisions than a comparable-sized term policy. Since disability is such a huge unfunded risk within most buy-sell agreements, this alone is a compelling reason to have at least part of the buyout amount funded by permanent life insurance. The other big unfunded liability found in most every buy-sell agreement is how to buy out retiring owners who don’t die or become disabled during their working years. Isn’t a normal retirement buyout the most likely scenario? There’s no way to insure per se for business owners who prosper throughout their working years and want to monetize their business equity come retirement age. However, there may be no better way for the remaining owners to grow their liquid reserves than with permanent life insurance. The last reason why permanent life insurance should make up some portion of the buy-sell agreement is cash flow management. Just look inside the major banking institutions where your business owners currently deposit their cash reserves. You’ll find that these big banks often invest billions of their own capital reserves into cash value life insurance.